Healthy Green Bean Salad Recipe with a festive feel. Can be made in advance. Pancetta is the secret ingredient that makes this moist stuffing really flavorful. If you don't have pancetta on hand, bacon works great too! I had the pleasure of trying this sweet potato recipe recently and I have to say it is the BEST sweet potato recipe I have ever tried. It is also easy to make. This recipe for Gingered Sweet Potatoes has become a family favorite. The garlic and ginger really compliment each other. The traditional holiday recipe with 36% fewer calories thanks to Equal® and fat-free evaporated milk. No one will miss the extra fat or calories. Serve with light whipped topping. 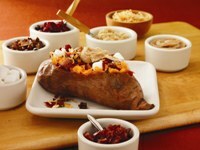 Make your own sweet potato bar and let your guests gussy up their spuds.